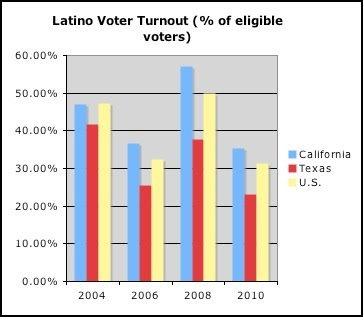 Note that with the sole exception of 2008, latino turnout has been dropping. “Democratic pollsters and analysts Stan Greenberg, James Carville and Erica Seifert in a memo based on focus groups of independents, /weak/ Democrats and /weak/ Republicans deliver the bad news to the president: No one buys what you are selling…. While the media will, as usual, play this election as a contest of who says what about what, in fact the big issue is who will turn out on election day. It’s not arguments but enthusiasm that will ultimately matter. And for Obama that means the young, latinos, blacks and independents. Over 90% of Romney’s supporters are white and many of them are scared, angry whites who at least subconsciously sense that not only is the American economic dream over but their status within that dream. America has too many people who don’t look like them. As for Obama’s backers, some of the disillusioned will go with the Green Party and many will not vote out of anger, frustration or the apathy that failure teaches. How many of these there will be we don’t know but we know it could easily decide the election. I don’t share with many of my Green Party friends the notion that politics is a form of religion and that one should react at the polls as a born again voter.. First, there is no historical evidence that at the presidential level this has worked since Abe Lincoln won for the new Republican Party and, second, I have lived in places like Boston, Philadelphia and Washington where one rarely associates politics with the higher virtues. It is not about personal salvation brought about by casting the right ballot, but a collective, pragmatic way to make things work as best one can in a town, state or nation. But many assume when we go to vote that we are helping to define the future and thus can be passionate when it works and angry when it fails. The truth is that elections are basically a formal poll of where we are at that moment in time. It is the product of all the political activity, organizing and arguing that has gone on before. It doesn’t determine the future for a large number of reasons, one of which has been dramatically demonstrated by Barack Obama: namely that politicians rarely do what they promise, either because of deceit or difficulty. For such reasons there are those who will not turn out in November on the grounds that both choices are worthless or evil. And there are those who will not turn out because the whole subject just depresses them or no longer is of interest. But what if we change our view of elections so they are seen as a tool for what one is trying to achieve rather than an ultimate goal? What if the purpose of voting is not to come up with a saint, but to make our struggle easier? What if the most important day is not Election Day but the day after? I have on several occasions asked politicians whom I was supporting this question: what do you plan to do when you lose? Other than the shocked look, I got no good answers, even when I tried it on Dennis Kucinich. But if you’re running a tiny chance race for president or some other slot, isn’t it a fair question? And isn’t the failure to not have even thought about it reflective of a missed opportunity? Just consider all the names, phone numbers and enthusiasm that have disappeared the day after well planned but failed campaigns. What if the campaigns had been used not as an ultimate goal but as another form of organizing? Which is how I came up with the idea of the Obama One Night Stand. What if voting for Obama is to get rid of Romney and the other fools of the Republican Party and to make it easier to pursue progressive goals over the four years? What if we think of it as just another one night stand? The minute you start thinking this way, Obama’s faults become almost irrelevant and the campaign suddenly becomes one big organizing tool. I often hear people say that there is no difference between the two parties and their candidates. In fact there is a big difference on a number of them: abortion, Amtrak, birth control assistance diversity of appointments extension of unemployment benefits. food stamps, unemployment benefits environmental issues, gay marriage and separation of church and state to name a few. But even more important is the fact that if Romney is elected there is a seldom mentioned but horrendous likelihood that he will be joined by an all Republican Congress – the most conservative one in 80 years. The GOP only needs to pick up four seats. It already has one in the slot and seven other possibles, far from a good sign. Even Harry Reid, that nit on a gnat’s nut (to borrow one of Dan Rather’s phrases), begins to look better when you consider the alternative. - There must be a clear cause centered on a few key economic issues. Not ones that affect the GDP, international trade or make the private sector feel “fine” but real live things that help people with jobs, income and mortgages. And no gay marriage stuff, no abortion talk, no liberal gobblygook. Rather basic, gut bucket issues. - There must a clear plan to launch a new movement for these causes the day after the election, making the point that having a Democrat in the White House and a Democratic Senate is essential to get these things going, not because we can expect their enthusiastic support but that their opposition will be much less. The kickoff should involve thousands of groups across the country on the same page, the same issues and the same day. - Keep the Democratic Party and its front groups like Move On out of it all. They’ll just muck things up. Labor unions, churches, activist groups of all sorts: fine. - Start now bringing the people who feel so frustrated and defeated together. The could be social groups called Apathy Anonymous and there could be cross-issue gatherings of local activists so they begin to discovered that there are more us than they think. The real answer, as it always does, lies in organizing outside the traditional political boundaries. The fact is that a Romney election with a GOP Senate would be a disaster while Obama is just a chronic disease. The best solution is to give Obama one day and keep the rest for America.